Since having a child, I have become increasingly aware of the world around me. I can’t read the newspaper or listen to the news without something bothering me. Something that gives me a stark reminder of the world we live in. Though we parents we try our hardest to protect our children, we can’t always be with them. With schools all over the world commencing this month, children will soon be flocking to internet resources for both school projects and sheer enjoyment. The internet is a realm that we as parents will have one of the most difficult challenges in terms of protection. We now have to worry about stuff like cyber-bullying and sickos praying on children. As parents, it is so important that we implement computer-use guidelines early on and make sure they are reinforced. I am of the opinion that passwords, especially in young children, need to be shared. We need to know what is going on with our children and computer time. If children are young (less than high school) they don’t need their own computer. 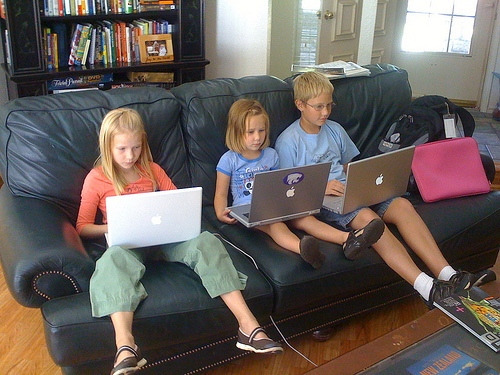 Even in today’s computer driven world, a home-based family computer will do. Place the computer in a family friendly area where you can’ easily see what they are doing. Make sure it’s in a spot they can get some quite time if doing homework but not locked away in their bedroom. There should be 100% transparency with what happens during computer time. Everything from homework to Facebook. The computer is not the place to be sharing private or personal information. Your child should have nothing to hide and gladly share all passwords with you. Children need privacy but the internet is not that place to do it. Encourage them to write in a diary or talk on the phone with friends. Make sure the understand the importance of never sharing anything private. While I respect that kids need computer time for homework, kids in general spend way too much time in front of screens. Set a realistic time limit to how much screen time they are allowed per day and abide by it. Make sure children regularly engage in activities that don’t involve technology. Cooking, sports, drawing, reading, something other than retina-burning screens. Facebook (and all other social media) brings a whole new level of safety concerns onto my radar as a mom. You can connect with people all over the world and quickly find out everything about them in an instant. Make sure you pay attention to your child’s social media accounts. Check in on them regularly and make sure you know who they are talking to. As a parent you should know everyone on their social media sites. If you don’t know who someone is (classmate, friend-of-friend), find out. With the rate that technology accelerates it will be so important as parents to stay on top of everything. There’s a fine line between protecting your child and invading their privacy, but I don’t think the internet is a place where private information should be shared and children need to understand that. If guidelines are laid out early on, there will be much less resistance and more mutual respect. What is your take on computer safety and children?